First things first, I am headed home tonight. Going to Toledo for the first time since August. It feels like it has been a bit longer than that, although I know it is not. The last time I was there was when J was playing golf in an outing for his little cousin who was killed last winter. I am sure that I wrote about that at the time. This trip is for the annual girl's trip to Bronner's and Frankenmuth, MI. I briefly mentioned last years trip here. The trip always involves, me, my mom, my cousin Megan (who you will remember from our trip to Cleveland this past fall), her mom - Aunt Laurie, who is my godmother, and most times my sister. My sister did not usually go with us in the early years of this trip. She was always busy with boyfriends and stuff. I always let my boyfriends do whatever they wanted on this day so I could take this trip. J gets it. He is staying home this weekend by himself. Well, with the dogs. If you will remember, last year I took Teek home with me. But I think Teek needs to stay with him this time, they spend too much time apart for lovahs. lol. I am pretty much back on the horse running wise. Things are still a bit tight in the knee, but it is getting better every day and I am starting to feel more like my old self. Yes, I realize it was just 4 days ago that I got hurt. But I was starting to feel a little bit LOST without it. Yesterday I ran 4 miles. I am not sure on the splits, but it ended up being in right around 9 minutes/mile. 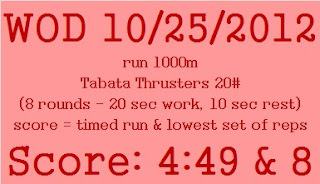 I used the last 1000m as part of yesterday's WOD. 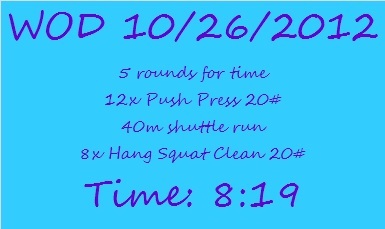 Here is the workout. 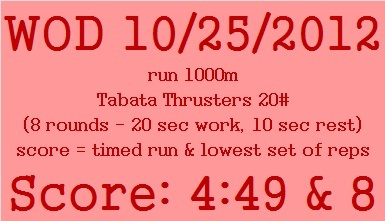 Those thrusters were rough! I am a little disappointed in myself because I feel like I used to be so much stronger before running took over my life. And I am sure that I was. So I guess I just need to be better about lifting from here on in and it will come back right? After yesterday's oh-so-rude wake up by the doggie, I decided to get up early this morning and hit the gym. The actual GYM. Not just get up and run (as I did for nearly the entire summer) but pick up a barbell potentially! So I started out with three miles on the treadmill (I told you guys, my body just LOVES running!) I took it pretty easy and just did a little progression-type run. 1 mile @ 6.3, 1 mile @ 6.4, and 1 miles @ 6.5. I ended up with 9:23 pace overall. And pace wise it felt pretty effortless, which I was happy about. I finished the run in 28:13. I have run 8.25 miles so far this week, and plan on squeezing in at least a few more in the morning tomorrow. YUSS! Once again, my strength (well, lack there of) baffled me. I used to be SO STRONG. But I will get it back, I am sure of it. I made the decision while doing squat cleans that I am going to go out and buy some PVC piping. Then I am going to use it to help with my form for some of these Olympic lifts. I am familiar with all of them, but I would like to make sure that I am doing them properly and stuff before I start adding weight. Especially since I am not using a box for Crossfit right now.